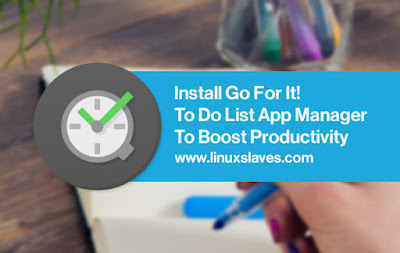 Stylish To-Do List App With Timer - There are many to-do and reminders applications for Linux out there. Today I will show you one of them. 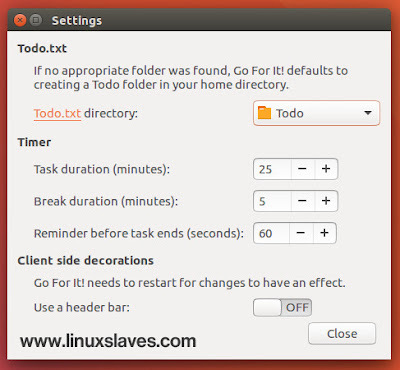 Of course, it's completely free and open source software to managing your tasks in your Linux desktop. What app you used to manage any tasks? I preferred Indicator Stickynotes to manage my to do lists so far. Unfortunately, it doesn't has synchronize feature. So I'm looking for new app to handle the lack and landed to Go For It!. Go For It! is a simple and stylish productivity app, featuring a to-do list and built-in with a timer that keeps your focus on the current task. 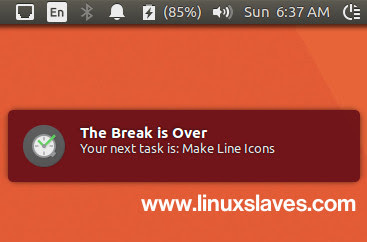 The app available for Linux and Windows based. An OSX version may follow in the future. It lets you to synchronize your tasks on your mobile device ( the available for Android and iOS ). The to-do lists are stored in the Todo.txt that currently connected to Dropbox cloud service. This simplifies synchronization with mobile devices and makes it possible to edit tasks using other front-ends. If you already use Todo.txt, beware of the fact, that Go For It! automatically archives completed tasks to the done list! How To Install Go For It!? Once installed, open the app from Ubuntu dash, or slingshot-launcher if you're an Elementary user. Alternatively, you can simply grab the .deb package installer from its official PPA page. Expand the go-for-it to see the package details ( i386 for 32-bit and amd64 for 64-bit). Cheeerrrs! Enjoy Go For It! in your desktop! It's pretty easy. There 3 tabs at the top of app : To-Do, Timer, and Done. All of your task will be saved in ~/Todo/todo.txt and done.txt for complete tasks list. 25 minutes is the default timer as shown. Of course you can customize the timer. You can change all these preferences by accessing setting menu. So, that is all I can write about Go For It! A great to list app for Ubuntu Linux and derivatives like Linux Mint and Elementary OS and the step-by-step to install via PPA. Hope you've enjoyed reading this post. Thanks for visiting us!